He was a weight lifter when he was in high school. 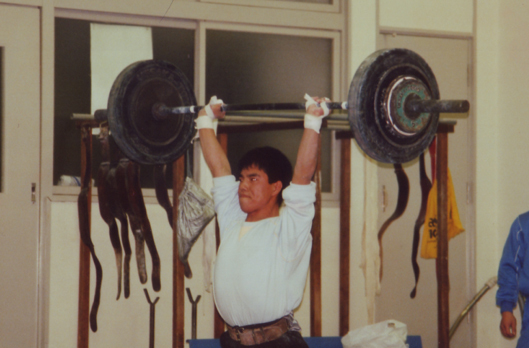 His high school team was extremely strong; his seniors set a new national record and represented Japan in the Olympics, and his classmates won the All-Japan Championship. He was also a member of the team, practicing hard to qualify for the Inter-High School Championship and win the team competition. However, intensive training and a lack of knowledge in sports medicine produced a hernia in his intervertebral disk that ended his athletic career before his abilities could be fully realized. "There was no one around us at that time who would teach us the importance of stretching and conditioning." His own experience led him to pursue a career as an athletic trainer. After finishing high school, he went to a vocational college. Having obtained a national qualification as a judo therapist, he performed therapy in an orthopedics department at a hospital for five years. The director of the hospital was a team physician for the judo team representing Japan for the Barcelona and Atlanta Olympic Games; he was, therefore, given opportunities to actually see the athletes undergoing treatment and rehabilitation. 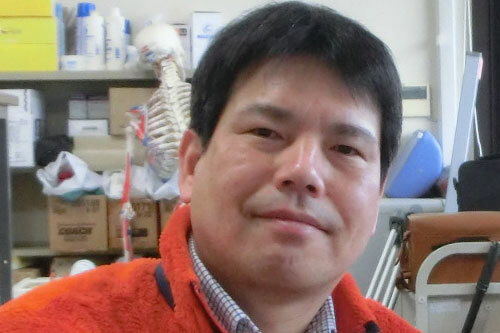 Then, on a recommendation by the Fukuoka Prefectural Sports Association, he attended a two-year course for athletic trainers provided by the Japan Sports Association. There, he was even more deeply fascinated with sports science. "I already knew the procedures from surgery to hospital discharge that injured athletes would undergo, but I wanted to learn more about sports science and pursue it even further." He entered the Graduate School of the National Institute of Fitness and Sports in Kanoya and went on to complete the doctorate course. He then became a researcher for his alma mater at the age of 35 and got involved in health promotion for elderly people. Although he started relatively late as a university researcher, his asset was his familiarity with therapeutic practice. His wife was working as a nursing care manager, so he also learned a lot from her about the actual lifestyles of the elderly. Not many researchers know what needs to be considered in geriatric studies, provide attentive care, communicate with people involved, interact with the elderly in nursing homes, and get along with them when pursuing their research. Currently, he is involved in studying two different populations: athletes and the elderly. He says elderly people tend to be more difficult to work with because they are often less motivated to do exercises. The oldest patient he had under his care in his rehabilitation practice was a 97-year-old woman who had fractured her hip. "Rehabilitation exercises that seem to be easy for us can be really difficult for old people. She was complaining she would rather die than go through such hardship. I coaxed such a reluctant patient into doing exercise until she actually felt the effectiveness, encouraging her to continue until she has a great-great-grand-child, and she improved enough to be able to walk home after the surgery. It was a valuable experience for me." He once dreamed of joining the national team as an athletic trainer and supporting the Olympic athletes, but now he is interested in doing studies to support such athletic trainers as well as health fitness programmers for seniors. He wants to scientifically analyze and quantify the knowledge that the top-tier trainers and health fitness programmers apply when instructing athletes through rehabilitation programs or teaching exercises for senior health promotion and preventive care. Thus, he would like to show the concrete path even inexperienced practitioners could follow to be able to provide high-level instruction and guidance. "I would like to set up achievable milestones that practitioners can follow well. Then, I believe even less experienced trainers and coaches will be able to instruct with confidence, knowing what kinds of effects their instructions can have." Title: Difference of exercise intensity and training effect by two kind of Nordic walking in community-dwelling middle-aged and older adults. Title: Quantitative evaluation of human muscle hardness using a new developed ultrasonography. Title: Association between the activity levels of neck flexor muscles and acceleration of head during JUDO’s ushiro-ukemi movement. Title: Association between knee extensor strength and EMG activities during squat movement. 1) Rogers ME, Rogers NL, Fujita E, Islam MM, Takeshima N. (2017) Muscle strength and size gains in older women after four and eight weeks of high-intensity resistance training. International Journal of Physical Education and Applied Exercise Science. 1(1), 22-28. 2) Fujita E, Takeshima N, Kato Y, Koizumi D, Narita M, Nakamoto H, Rogers ME (2016) Effects of body-weight squat training on muscular size, strength and balance ability in physically frail older adults. Int J Sport and Health Sci, 14, 21-30. 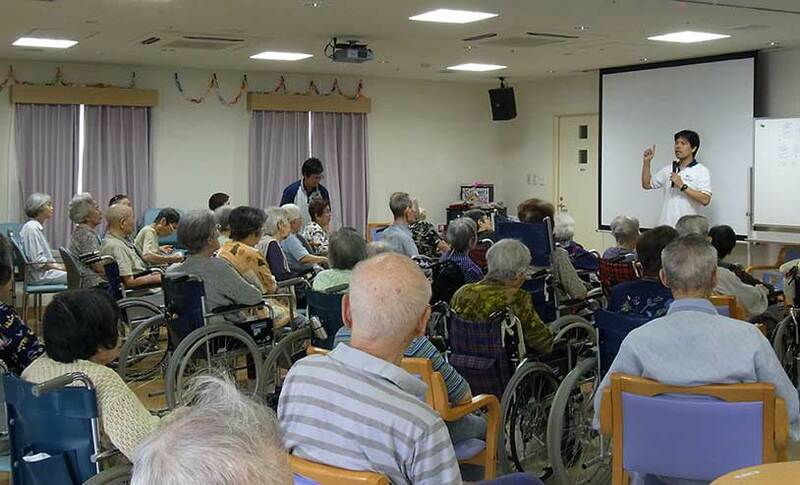 3) Abe T, Yaginuma Y, Fujita E, Thiebaud RS, Kawanishi M, Akamine T. (2016) Associations of sit-up ability with sarcopenia classification measures in Japanese older women. Interventional Medicine and Applied Science, 8(4): 152-157. 4) Yoshimoto T, Takai Y, Fukunaga Y, Fujita E, Yamamoto M, Kanehisa H. (2016) Effects of school-based squat training in adolescent girls. THE JOURNAL OF SPORTS MEDICINE AND PHYSICAL FITNESS, 56(6): 678-683. 5) Abe T, Fujita E, Thiebaud RS, Loenneke JP, Akamine T. (2016) Ultrasound-Derived Forearm Muscle Thickness Is a Powerful Predictor for Estimating DXA-Derived Appendicular Lean Mass in Japanese Older Adults. Ultrasound in Medicine and Biology, 42(9): 2341-2344. 6) Fujita E, Takeshima N, Kato Y, Koizumi D, Narita M, Nakamoto H, Rogers ME. (2016) Effects of body-weight squat training on muscular size, strength and balance ability in physically frail older adults. International Journal of Sport and Health Science, 14: 21-30. 7) Fujita E, Takeshima N, Hasegawa T, Narita M, Kato Y, Koizumi D, Rogers ME. (2015) Comparison of static and dynamic balance in healthy but untrained versus frail community-dwelling older adults. Physical Medicine and Rehabilitation International, 2(5): id1046. 8) Rogers ME, Rogers NL, Fujita E, Takeshima N.(2015) Balance confidence and functional ability in older adults aged 77-100 years. Indian Journal of Research. 4(2):43-44. 9) Fukunaga Y, Takai Y, Yoshimoto T, Fujita E, Yamamoto Y, Kanehisa H (2013) Influence of maturation on anthropometry and body composition in Japanese junior high school students.Journal of Physiological Anthropology,32(1): 5. 10) Takai Y, Fukunaga Y, Fujita E, Mori H, Yoshimoto Y, Yamamoto M, Kanehisa H. (2013) Effects of Body Mass-Based Squat Training in Adolescent Boys，Journal of Sports Science and Medicine，12，60-65. 11) Fujita E, Kanehisa H, Yoshitake Y, Fukunaga T, Nishizono H. (2011) Association between knee extensor strength and EMG activities during squat movement. Medicine & Science in Sports & Exercise, 43(12): 2328-2334.